Easy to transport and discard contents when dumped. Balanced design makes dumping of trash, waste, scrap, garbage, chips and debris more proficient. Built of welded 14-gauge (12 gauge on model ERSPTT-15) steel for strength and less weight. 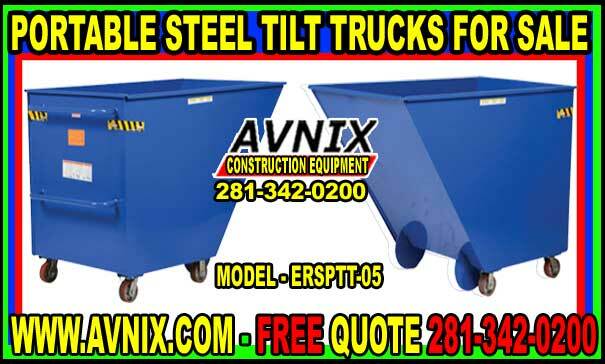 Tilt truck rolls effortlessly on (2) rigid and (2) swivel with brakes 5″ x 2″ poly-on-steel casters. Includes a blue baked-in powder coat finish for toughness. One of the major things to think about when fitting out any industrial business is to have the right material handling equipment in place for workers to be able to do their jobs correctly, and safely. One spot that should never be ignored when stocking a warehouse or store is the right kind of commercial carts for staff to use when moving items around, dumping trash or filling orders. What Are Some Applications For Tilt Trucks? The function of a tilt truck is basic but well-designed: it is a big hopper on wheels, perfectly engineered so it can be filled to capacity with trash, bulk products or waste and then simply tilting cart to dump load where it is needed. 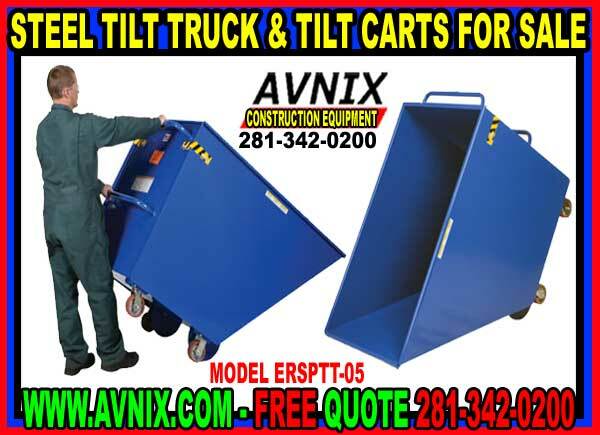 As fundamental as the design is, it is astonishing how efficient tilt carts are as a way of gathering, transporting and disposing of materials like soil, dirt, refuse, garbage, debris, fertilizer or landscaping mulch Avnix tilt trucks can boost your production, increase ROI, decrease injury to employees and make workers job much safer & quicker. On certain jobs, tilt trucks are the only option that makes good sense. For picking trash from dumpsters in malls or on the street, tilt carts can be pushed around and can simply be emptied into a larger trash skip or dumpster. Tlt trucks & tilt carts are a bit more costly than typical tilt containers, but the extra convenience it is certainly worth it. One of the main features of tilt carts is the ease of dumping, carts have bigger wheels too, so moving them around takes only a smallest amount of effort. If you have a lot of material to transport and dispose of, what are your options? Apart from the tilt truck, you could use a forklift, or even a skid steer loader to help in move material. They are fine for some applications, but your typical tilt truck does not need external power from a forklift or loader to be able to move material, meaning there is no connecting hydraulic lines or securing device to forklift forks. Also our tilt truck dumping feature makes them super easy to empty. Trying to manually lift a full load can be unsafe even when using a dolly.